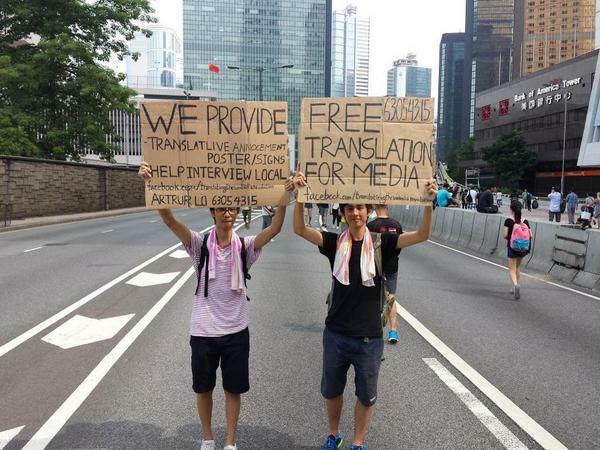 Far from prohibiting translation (see the last item here), the young demonstrators in Hong Kong are offering free translation services for the media and others who may be in need of them. While I'm not sure I'd fully rely on the guy on the left ("translatlive annocement…"), I'm sure that they're sincere and try their best. The same photograph appeared in Newsweek, where the caption says "Posted onto Reddit by members of Translating the Umbrella Revolution." And here it is on Reddit, which also links to the Facebook page for Translating the Umbrella Revolution. There we find as well another photograph of the same two signs, but with the young man wearing black in the above photograph now standing on the left, joined by a young woman standing on the right who is holding the other sign. All of this leads one to wonder about the fate of Cantonese language. We've had many Language Log posts bemoaning the ambiguous status and uncertain future of Cantonese, and now an article in the South China Morning Post raises this issue all over again: "Speaking up for Cantonese, a tongue in peril: The fact the language of everyday life needs to be included in a list of 'intangible cultural heritage' is cause for concern to its advocates." On the other hand, if Chinese police and armed forces do not completely crush the current demonstration, Cantonese may actually experience a remarkable resurgence. During the demonstrations, I've heard many people say to me, "I really should learn some Cantonese." The SCMP article refers to Cantonese as having 120,000,000 speakers worldwide, but I usually hear a figure of around 60,000,000 (see here, here, and here). So about half the number given in the SCMP article, but still a significant number, and we must keep in mind that Cantonese speakers have played a disproportionately large role in Chinese history of the last few centuries. Consequently, I do not think — as so many do — it is a foregone conclusion that Mandarin is just going to sweep over Hong Kong and cause Cantonese to disappear. So much depends on whether the PRC remains stable. 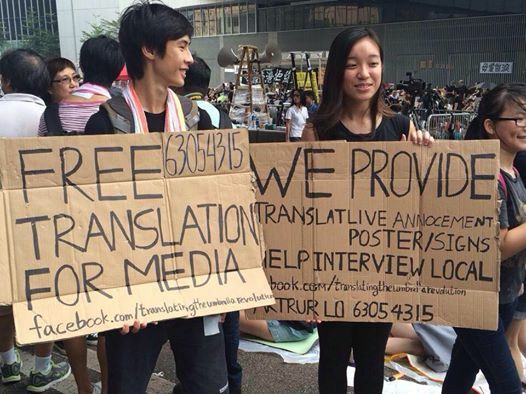 Hi, I'm Adrian from Translating The Umbrella Movement. Thanks for the coverage! While some of our signs are a bit faulty, we've been extremely busy working with foreign press and assisting them in their reporting, having worked with outlets like Al Jazeera, NYTimes, TIME, Le Temps, etc. I can't see where the SCMP article refers to 120m speakers of Cantonese. However, the Ethnologue data is mostly 10+ years old, and the Wikipedia articles refer to the number of native speakers. I assume that at least some of the other 50m non-native Cantonese-speaker residents of Guangdong (even migrant workers) will have some knowledge of Cantonese especially if they like watching HK TV. It probably still won't be enough to make up the discrepancy, but obviously a lot of overseas Cantonese may not speak it as their first language but will have some knowledge. However, one observation I have made in my travels around the western world is that the children of Cantonese emigrants often have poor or non-existent command of their heritage tongue. In contrast, I have only ever encountered 1 Korean who grew up overseas and whose knowledge of Korean was limited to reading Hangul. The figure of 120m is in a huge yellow bubble between the photograph at the top and the video just below it. I don't know how you could miss it, unless maybe you're using the print version of SCMP and that bubble wasn't in it. Would you please restate more clearly the point you wish to make about overseas Koreans' command of their parents' Mother Tongue? A senior editor at the South China Morning Post newspaper, Cliff Buddle, has been assaulted while giving a lecture on media law at the University of Hong Kong. A young man reportedly became angry that the lecture was in English and shouted "we are all Chinese and you should use Putonghua in class." The veteran journalist was reportedly hit on the head with a leather folder and kicked in the ribs, before being taken to hospital. Police confirmed that the young man was not a Hong Kong resident. He was taken into police custody. Mr Buddle was later discharged from hospital." Thanks for calling our attention to this unfortunate incident. ***Note that the "student" is quoted as saying that he thought it was all right to beat up a foreigner. *** The thug, who spoke Mandarin, claimed to be a Tsinghua student, but I suspect that he was a goon sent from the Mainland masquerading as a student. This is absurd, since English is the official language of the University and Cantonese may be used in Chinese classes. Putonghua (Mandarin) is rarely used in Hong Kong university classrooms.